Home / Community Watch / CUSERT is Hiring Student Volunteers! CUSERT is Hiring Student Volunteers! 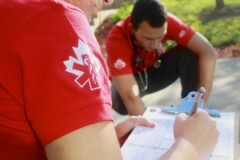 Are you looking for a positive way to spend your free time that involves helping others and improving your first aid skills, as well as getting to know other Carleton students? If so, CUSERT is for you! CUSERT’s annual application process is now open! Please read the information below about the application process. If you have any questions, please contact us. *If you are not certified yet but are planning on taking a course before September 17, 2018, you may still submit an application. We will also be offering a course in September that will help you meet this requirement. If you do not upload it with your application, you must submit your Standard First Aid / CPR Level C certification as soon as you receive it. The deadline for applications is September 15, 2018. Applicants are encouraged to apply as soon as possible as applications may be processed on a rolling basis. If all spots for our Initial Testing Weekend are filled before September 15, 2018, the application form may close before this date. You should therefore submit your application as early as possible. Please visit the following link for more information! If you have any additional questions or concerns, please email us at applications@cusert.com.